You know when someone recommends a book to you and you aren’t sure that you want to add it to your TBR list? My list is huge, but my sister promised that this book was worth moving to the top. Boy, was she right! 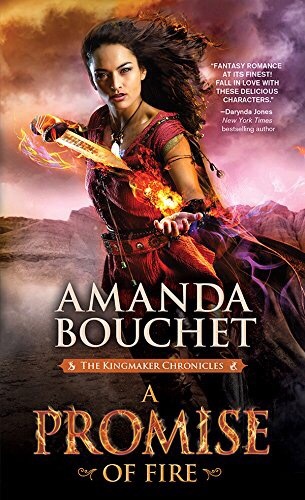 Amanda Bouchet has created a world that is part fantasy, part mythology, and a whole lot of action adventure. Cat, Catalia Fisa, is hiding out in a traveling magical circus. She has disguised herself as a Soothsayer, but her talents are so much more. She holds herself back from building relationships because she has learned from a very young age to not get close to anyone, because everyone, everything she has ever loved dies. One day, while working in the circus, she catches the eye of a warlord who see’s her for exactly what she is, and is determined to bring her home to help his family retain the country that they just conquered. Cat is taken against her will, and every moment after, makes Griffin’s life very difficult. True, she is sass and fire, however, it’s not just her personality that’s difficult, others also want to keep Cat for their own, and Griffin and his men have to fight mythological beings, and evil rulers to keep her safe. Cat doesn’t want anything but to hide away somewhere, but Griffin and his men wear her down, and she starts to make friends, which changes everything. Cat goes through such intense emotions, some of which are new for her. She doesn’t know how to be someone’s friend or lover. Her internal musings show her confusion over her feelings, that emotional weakness is at odds with her magical strength and power which creates a huge amount of tension that keeps amping up as the story moves on. Be prepared to read this through from start to finish. This story is gripping and you will not want to stop. I loved it. Buy it on Amazon, Barnes and Noble and Kobo.